Margaret Luchesse started with her friend's grandmother's prescription painkillers in 2010. She later got hooked on heroin. Today, the Seaford resident said she's clean and "there's just no room for heroin" in her life. Margaret Luchesse was a good student, an athlete and several weeks from starting classes at Northeastern University when she first took opioid-based pills with a friend. The decision to take her friend’s grandmother’s prescription painkillers in 2010 led to more pills and later to a heroin addiction that consumed five years of her life. The anti-opioid drug Vivitrol helped her finally kick her addiction. “If I didn’t go on Vivitrol, I’d be dead,” she said. Naltrexone, the active ingredient in Vivitrol, is one of three federally approved medications for opioid use disorder. Luchesse said she was treated with the two other authorized medicines, methadone and buprenorphine, during three previous, failed recovery attempts. She found Vivitrol more effective. Experts said buprenorphine — commonly sold under the brand name Suboxone — or methadone may be more appropriate for some people. Luchesse said when she first started using pills and then heroin, she never thought she could develop a dependence. “You do it and you think you have control and you think you can manage it, and then you suddenly realize you can’t, but you’re already sucked in at that point,” she said. As heroin became more of a focus of her life, and when the man who introduced her to the drug became her boyfriend, she abandoned plans to attend Northeastern. She was able to hold down jobs, but she was moving through life aimlessly and without ambition. Her relationship with her parents soured, she said. Finally, Luchesse decided she'd had enough. She realized she couldn’t fulfill her dreams of graduating from a four-year college — she earned an associate degree before she got addicted — unless she stopped taking heroin. She also worried about getting arrested. A few months before starting recovery, she had a scare when, while driving to meet her heroin dealer, a police officer pulled her over because he thought she was using her cellphone. He let her go, but “it was a wake-up call,” she said. The Pennsylvania recovery center she entered in late 2015 used gradually decreasing amounts of Suboxone over three days to help prepare her for a complete detox. Suboxone is opioid-based and is often used during withdrawal. She then endured a week of withdrawal that she described as akin to a severe case of the flu. One-on-one counseling and meetings of self-help groups such as Alcoholics Anonymous and Heroin Anonymous helped her stay on track. Eden Laikin, co-facilitator of a Vivitrol support group at St. Bernard’s Catholic Church in Levittown that Luchesse sometimes attends, said, “Margaret is a miracle.” Laikin is buoyed by how, over the more than three years since Luchesse stopped using heroin, she has rebuilt her life. Luchesse contacted Laikin when she was liaison to former Nassau County Executive Edward Mangano for drug prevention, and Laikin linked her to recovery services, including Vivitrol treatment. Luchesse now has a full-time job helping people with developmental disabilities and hopes to graduate from the online CUNY School of Professional Studies in spring 2020, and then attend graduate school to pursue a master’s in vocational rehabilitation. 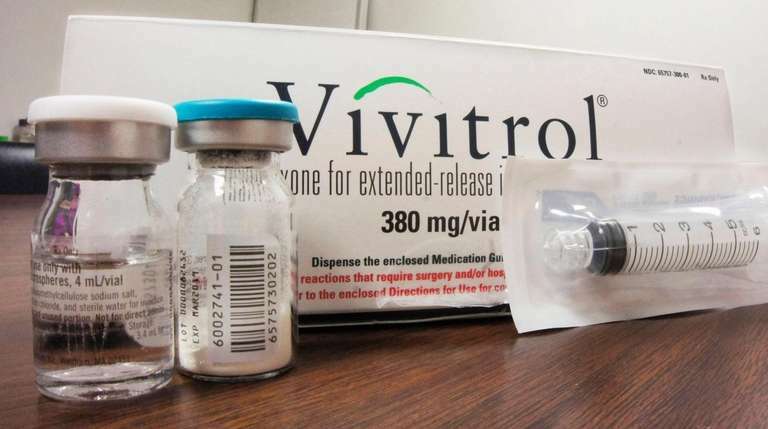 Opioid addicts turning to drug to come cleanAddiction specialists say the medication, Vivitrol, is effective for some people in recovery when combined with counseling -- but they warn it is not for everyone.